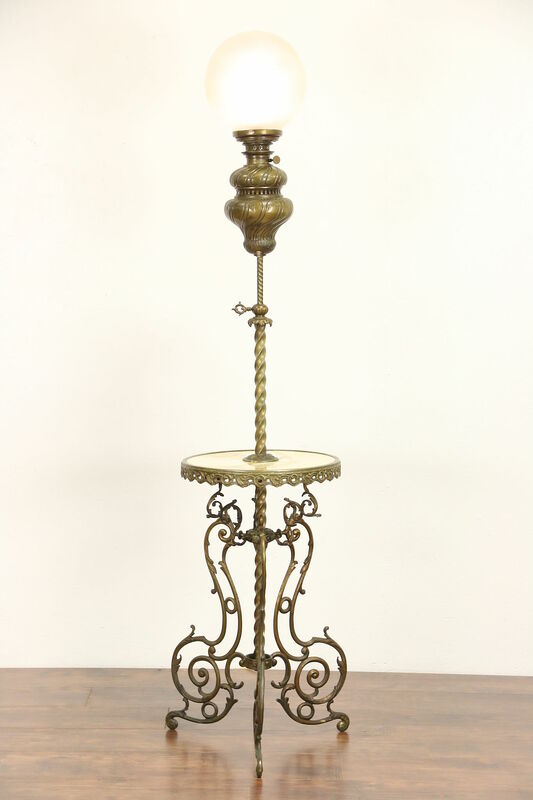 A Victorian "piano or organ" lamp from the 1880's has adjustable height to use when reading music at an instrument and is signed "A W, Bruxelles," Belgium. Originally oil or kerosene burning, it has been rewired for electricity, there is a switch on the oil font. There are other French inscriptions which are difficult to read, see photos. Solid brass with nice antique patina, the genuine onyx table has been polished and sealed to resist stains. The 10" diameter cut and etched ball shade is antique and of the era. A set screw adjusts the spiral column from 68" to 90" tall. Onyx table diameter is 16" and legs are 20" across.